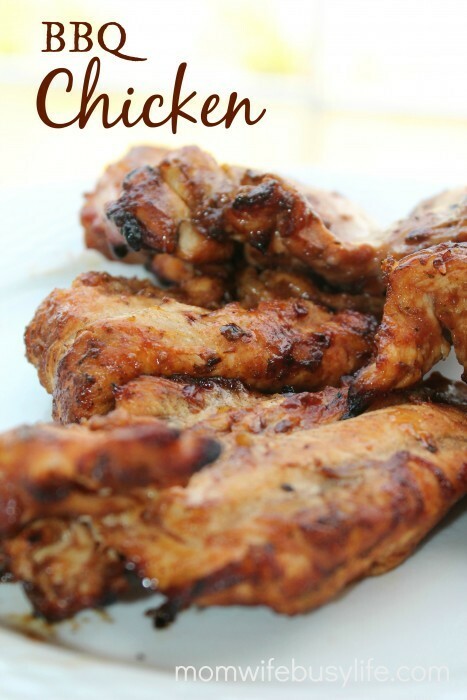 BBQ Bacon Cheeseburger + BBQ Chicken Recipe - Mom. Wife. Busy Life. Summer is here and it’s hot over here on the East Coast. The temperatures were in the 100’s last week! Thanks to a few thunderstorms that rolled in over the weekend, we finally caught a break in the high temperatures and experienced cooler temps. We also decided that it was the perfect weekend for backyard grilling! My husband grills for us on a regular basis. He loves to grill and smoke yummy treats for us including grilled chicken, hamburgers, ribs, briskets and other delicious foods. 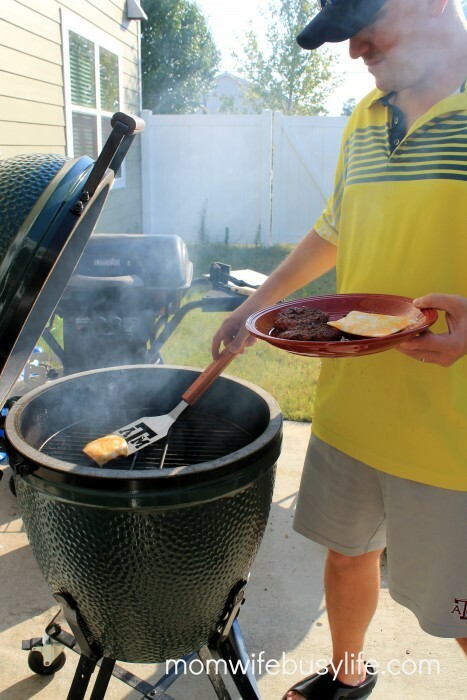 This weekend, we grilled hamburger patties for our BBQ Bacon Cheeseburgers! 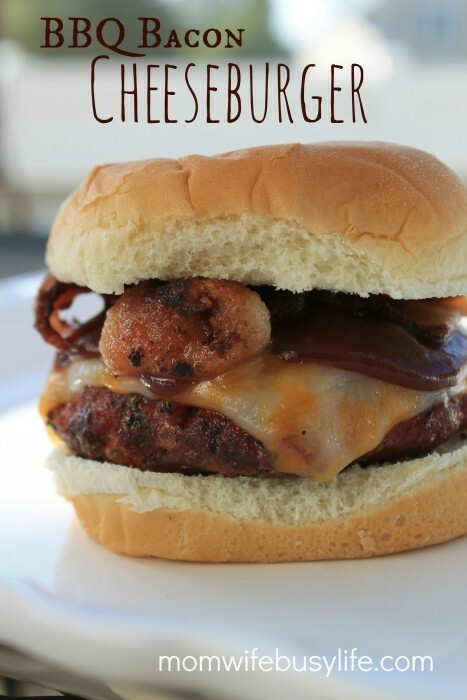 The secret to these great tasting BBQ Bacon Cheeseburgers is in the sauce! 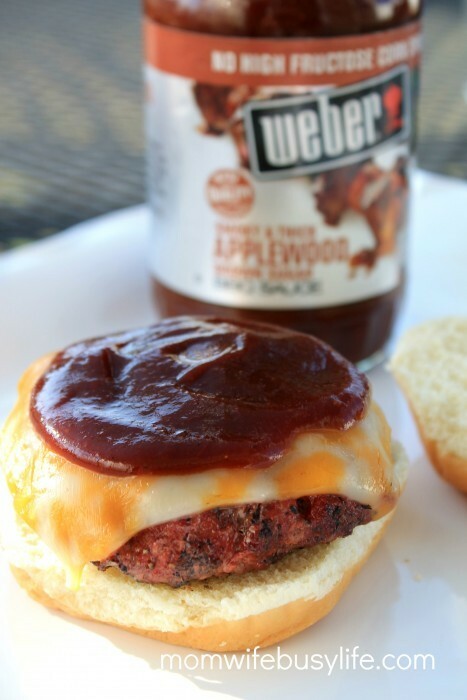 Use Weber BBQ sauce on these cheeseburgers for added flavor! The new line of Weber BBQ Sauces adds rich, bold taste to my grilled food without any high fructose corn syrup or artificial flavors and artificial preservatives. I used Weber Applewood Brown Sugar BBQ sauce to top of my perfectly grilled bacon cheeseburger. The thick, flavorful sauce tied the rest of the elements of the burger together, which had my family calling for more BBQ bacon cheeseburgers! The tasty food gave my whole family a reason to celebrate the end to a busy but successful week. Form ground beef into patties and flavor with your choice of seasoning (I use a combo of Kosher salt, coarse black ground pepper, onion powder, and garlic powder). Grill to your liking – medium, to medium well. Because this is ground beef, it is recommended that the internal temperature be at least 160 degrees Fahrenheit. Place cheese on top of grilled patty and allow cheese to slightly melt. Pour a spoonful of Applewood Brown Sugar Weber BBQ sauce on top of the patty. Add two slices of bacon and place hamburger patty on a bun. We didn’t stop there! On Saturday afternoon, I used the Weber Original BBQ Sauce to marinate boneless chicken breasts and thighs. Add a cup and a half of Weber Original BBQ sauce. Give the chicken a few tosses with the Weber Original BBQ sauce in the bag. Let sit for 1 hour in the fridge. Place on grill and grill until done. The newly formulated Weber BBQ “sticks to my food”, and it made mopping or brushing the chicken with additional BBQ sauce unnecessary. The Weber Original BBQ enhanced the flavor of the grilled chicken, but it also made preparation and cooking easy and enjoyable. It gives me peace of mind to know that I was cooking using BBQ sauce that had no high fructose corn syrup or artificial flavors or artificial preservatives. It is important for me to provide my family with the best food possible, and the new line of Weber BBQ sauces delivers. All of the Weber BBQ sauces including Original, Honey, Hickory, Sweet ‘N Spicy, and NEW Applewood Brown Sugar are in grocery stores today. Pick up your favorite flavor of Weber BBQ Sauce and add flavor and enjoyment to your next outdoor cookout! What yummy treats do you enjoy from the grill? 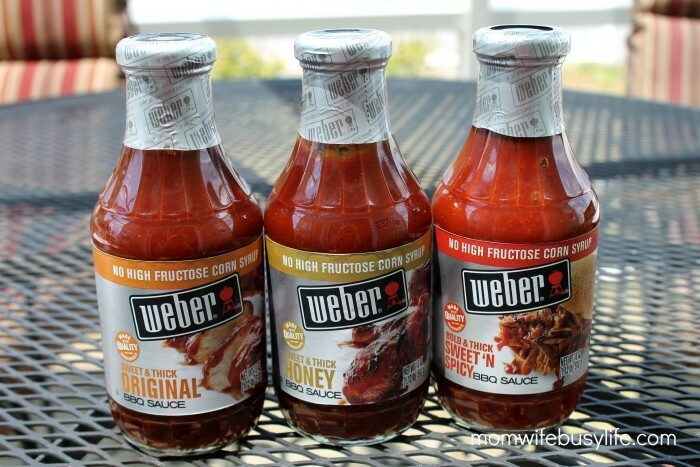 This is a sponsored conversation written by me on behalf of Weber Sauces & Seasonings. The opinions and text are all mine. Ooh. Applewood brown sugar barbecue sauce and those burgers sound fantastic! I think my hubby would go crazy for them! I wish I had this right now. It sounds so good. I just bbq’ed chicken this week.